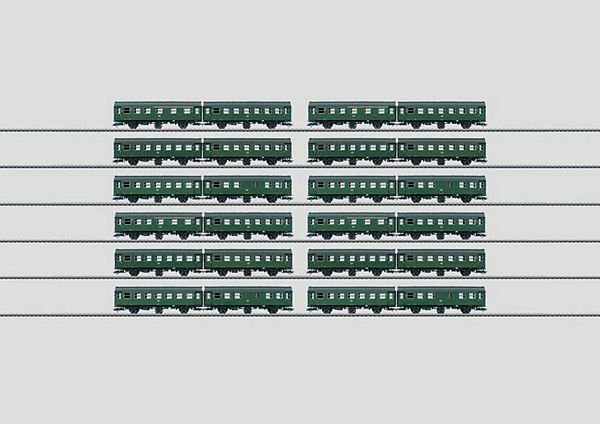 Prototype:3 German Federal Railroad (DB) pairs of passenger cars consisting of "Umbauwagen" / "Rebuild Cars". Pair of Umbauwagen type AB3yg 756, 1st/2nd class, and type B3yge 761, 2nd class, pair of Umbauwagen type B3yge 761, 2nd class, and pair of Umbauwagen type B3yge 761, 2nd class, and type BD3yge 766, 2nd class with a baggage area. Era IV. The cars look as they did around 1970. Model: The 3 pairs of cars is permanently coupled together. Each pair of cars comes individually packaged in a marked box. Length over the buffers per pair of cars 30.5 cm / 12. 3 pairs of cars . All of the models have scale detailing. DC wheel set per pair of cars 4 x 700580 and 2 x 406240.